Hartford Central School will welcome one of its own as the new superintendent this July. Andrew Cook, the current middle and high school principal will replace Thomas Abraham, who is retiring. Cook said he is excited about his new appointment. Currently, Cook said he is responsible for everything that goes on in grades six through 12, from student discipline to teacher observations. With his new position, he’ll relinquish those responsibilities to the new principal. 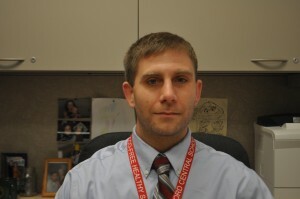 Now in his sixth year as a principal, Cook previously taught social studies in Whitehall. His new duties will cover everything from kindergarten to 12th grade. He’ll be maintaining federal and state grants, working on district budgets, monitoring the school, making policy recommendations to the Board of Education and performing other tasks. Abraham, who will be working on this transition with Cook through the rest of the school year, thinks that the school board made the right choice. “With his background, it was a no-brainer,” Abraham said. While the board knew they wanted to look within the school for a replacement, Abraham feels that Cook was the most qualified person internally or externally. “The board had to look at requirements, and they understood the quality they had in the building,” Abraham said. The Board of Education requires the school superintendent to live in Hartford. Cook, who currently lives in Hudson Falls with his wife and two sons, said the family had been looking at homes in the district even before his new appointment. Their current home is for sale, and they have a contract for a house in Hartford. Cook said his family is embracing the move. His wife grew up in Kingsbury and loves a rural setting, and after working at Hartford, he said he has grown to really appreciate the country as well. However, his desire to move goes deeper than his surroundings. “What made some of my decision to move into this town is the level of support and professionalism of the staff,” Cook said. “I have a strong passion for this school system; the teachers and faculty have a strong desire to help students succeed. They continue to go beyond the call of duty,” Cook said. He said he has also been involved with the extracurricular activities in Hartford for a while and is excited to have his kids go through the system. Though Cook, at 31, is taking on his new role at a relatively young age, Abraham is confident in his capabilities. “One thing I’ve learned from working with him is he’s a very fast study; he thinks on his feet, and he very seldom rushes into decisions,” Abraham said. Abraham also said the teachers and faculty at the school feel good about the board’s decision. While Cook said he might look into adjustments to the school system down the road, he said the administration first has to deal with statewide issues. “One of the most difficult aspects of coming in now is all of the changes that are currently going on in state education. We need to be really comfortable with those new mandates before looking to make drastic changes,” Cook said.